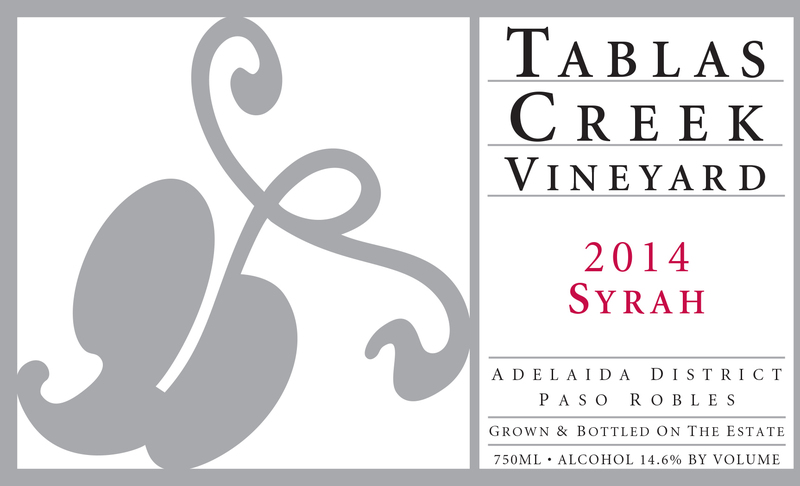 The 2014 Tablas Creek Vineyard Syrah is Tablas Creek’s tenth bottling of this classic Rhone varietal. The wine displays the character of the Syrah grape exuberantly and elegantly, with classic flavors of bacon fat, wood smoke, blackberry and mineral, and should reward time in bottle to mature. The 2014 Syrah has a luscious nose of: blackberries, prime rib drippings, tobacco leaf, Chinese five spice and a little cedary oak. The mouth is richly tannic: new leather, black raspberry, plum skin, sweet oak, and baking spices. A polished syrah, more Cote Rotie than Cornas, for those with a northern Rhone background. Decant in advance if drinking soon, or wait up to two decades. We use most of our Syrah as a part of our Esprit de Tablas and Côtes de Tablas blends each year. However, we believe that Paso Robles is one of the world's great environments for Syrah, and in favorable vintages we try to reserve some particularly classic barrels of Syrah for a single-varietal bottling. The 2014 vintage was our third consecutive drought year and saw our earliest-ever beginning to the growing season. The summer was warm but without serious heat spikes, and our coolest August in a decade slowed ripening at a critical period. When it warmed back up in September, the fruit tumbled in, and we finished in mid-October, about two weeks earlier than normal. The result was a vintage with excellent concentration balanced by good freshness, which should be vibrant and powerful young, but with the balance to age. Syrah was harvested between September 5th and October 1st. The grapes for our 2014 Syrah grapes were grown on our certified organic estate vineyard. The Syrah grapes were destemmed and then fermented using native yeasts in small open-top stainless steel tanks. After two weeks, they were pressed, and moved to a balance of new and old French oak barrels to complete their fermentation. The wine was assembled in May of 2015 and aged for nearly another year in a 1200-gallon foudre before being bottled in April 2016.